Limburg is a province of the Netherlands. 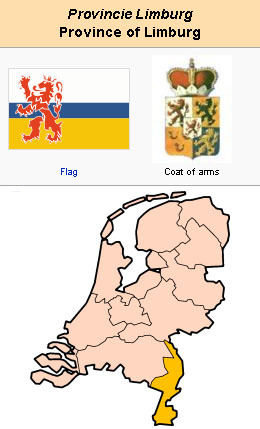 In the 16th century the northern part belonged to Gelderland, the middle part to the duchy of Jülich, whereas the southern part together with Maastricht was subject to the prince-bishop of Liège as well as to the emperor. Even before 1530 there are indications of the spread of "heretical books." In Hoengen near Sittard the priest Dionys Vinne preached evangelical sermons in April 1530. In 1534 a group of Maastricht people went to Susteren, to hear the sermons of a "suspicious and infamous preacher." Hoengen as well as Susteren are in Jülich territory, where Duke John III paid little attention to the work of the reformers. It is not certain whether the preachers in these cases were Sacramentists or Anabaptists. Others who preached Protestant doctrine were Dionys Vinne of Diest, Gillis von Rothem (whom Vos confused with Gillis of Aachen, ML I, 2), Johann Klopreis, Hendrik Slachtscaep (of Tongeren), Gottfried Stralen, and Hendrik Rol (see also Wassenberg Preachers), who were very influential, but went to Münster one after the other (Gillis von Rothem was captured before he reached Münster). In the following years, probably through the influence of these men, the Münster movement increased in Limburg; Rol or Slachtscaep wrote an epistle to them; there must have been a congregation in Maastricht of more than a hundred members, in which there was some trend to revolutionary ideas in 1534. Forty Limburg Anabaptists led by Jacob van Ossenbrugge started out for Münster but were stopped at Düsseldorf on 20 February 1534. Henric Rol, who was active in Maastricht for some time until he was arrested there on 2 September 1534 and executed shortly after, had a beneficent influence upon the congregation, which, however, was nearly wiped out by persecution in January 1535. There were also Anabaptists in other places, e.g., in Venlo and near Roermond; in the villages Visschersweert and Illikhoven they were numerous. Menno Simons preached in the vicinity of Roermond in 1545. Also Elder Theunis van Hastenrath worked here with great success. Van Braght named several nonresistant blood witnesses of Maastricht, two in 1559 and four in 1570. On 30 November 1652, Wolfgang Wilhelm of Pfalz-Neuburg put up a notice announcing that the Anabaptists who would not join the Catholic Church would be expelled from the duchy of Jülich. Many went away and settled in Nijmegen and Maastricht. From this time there was a congregation in Maastricht, which existed until 1823. In Vaals on the German border there was a church which was used by the Mennonites of Aachen until 1785. In 1956 there was only one congregation in the province of Limburg, called Zuid-Limburg or Heerlen, where Mennonites living in this coal-mining district founded a circle in 1926 and an independent congregation in 1936. The meetinghouse and parsonage were located at Heerlen. To this congregation also belonged the Mennonites living at Maastricht, Geleen, Sittard, etc. The few Mennonites scattered through the northern part of the province were regularly visited by Mennonite ministers sent out by the committee for the Mennonites in the diaspora (see Verstrooiing). The total number of Mennonites in the province of Limburg in 1859 was 16; 1889, 69; and 1947, 285. Bax, Willem. Het protestantisme in het bisdom Luik en vooral te Maastricht. s-Gravenhage: Nijhoff, 1937-1941: I-II. Doopsgezinde Bijdragen (1894): 89; (1902): 135; (1909): 120-126. Habets, Jos. Gedenkboek der Hervormde Gemeente van Maastricht. Maastricht, 1932. Habets, Jos. De Wederdoopers in Maastricht tijdens de regeering van Keizer Karel V. Roermond, 1877. Hege, Christian and Christian Neff. Mennonitisches Lexikon, 4 vols. Frankfurt & Weierhof: Hege; Karlsruhe: Schneider, 1913-1967: v. II: 656. Vos, Karel. "Anabaptisten in Limburg." Zondagsbode 22 (1908-9): No. 21. Vos, Karel. Menno Simons, 1496-1561, zijn leven en werken en zijne reformatorische denkbeelden. Leiden: E.J. Brill, 1914: 85-87. Zijpp, Nanne van der. "Limburg (Netherlands)." Global Anabaptist Mennonite Encyclopedia Online. 1957. Web. 19 Apr 2019. http://gameo.org/index.php?title=Limburg_(Netherlands)&oldid=146568. Zijpp, Nanne van der. (1957). Limburg (Netherlands). Global Anabaptist Mennonite Encyclopedia Online. Retrieved 19 April 2019, from http://gameo.org/index.php?title=Limburg_(Netherlands)&oldid=146568. Adapted by permission of Herald Press, Harrisonburg, Virginia, from Mennonite Encyclopedia, Vol. 3, pp. 346-347. All rights reserved.